Q&A: What is the Incidence and Common Cause of Anesthetic Death in 2014? The “fire triangle,” or “fire triad,” is taught throughout general fire safety education and is used as a point of emphasis for surgical fire prevention. Fire is the result of the combination of a fuel source, an oxidizing substance, and heat. In the operating room, alcohol-based preps and draping materials are the most common sources of fuel. Alcohol-based surgical prep solutions are excellent antiseptic agents but are also extremely flammable. In most operating rooms, the prepping and draping of the surgical patient is a role of the operating room nurse. Anesthesia providers use these same prep solutions for central line preparation and for regional anesthesia procedures. As surgical team members, our role should include increased vigilance whenever an alcohol-based prep solution is used in the operating room (OR). One of the pillars of surgical fire prevention is communication among surgical team members. Often the team member most engaged in the work at a given time can suffer from tunnel vision. Human factors related to production pressure and interruptions in workflow may result in overlooking critical elements such as allowing adequate drying times and assessing for alcohol pooling near the surgical field. In emergency cases where alcohol prep is used, adequate drying time is still required. The anesthesia provider should remain observant and speak up if alcohol excess or pooling is noted. Table 1 lists commonly used surgical prep solutions along with the isopropyl alcohol (IPA) content and the added antimicrobial agent. Prep solutions should be dispensed in unit dose applicators, swabs, or similar applicators for cases where an ignition source is being used or contemplated. Povidone iodine such as Betadine® and chlorhexidine solutions such as Hibiclens® are not flammable prep solutions and do not need a set drying time to prevent ignition. Alcohol-based skin preps are required to have US Food and Drug Administration (FDA) approved package inserts. These inserts are quite informative and contain directions and warnings specific to the individual product and the size of applicators. For instance, labeling reminds users that 26 mL applicators are not to be used for head and neck cases. Personnel using solutions are expected to be familiar with the content of the package insert prior to use on a patient. 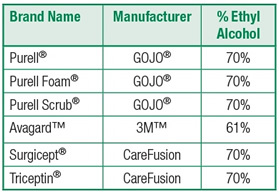 The following table lists commonly used alcohol-based hand rubs (ABHR) along with the ethyl alcohol (EA) content. Many products in the current market are for use by health care professionals as a hand scrub prior to donning surgical gowns and gloves. These products are to be used with water and usually consist of an antimicrobial or bacteriostatic base agent such as iodine, chlorhexidine gluconate, or parachlorometaxylenol mixed with buffering agents and a small amount of ethyl or isopropyl alcohol. The alcohol content of these solutions is usually under 5% and, considering the other components of the detergents are non-flammable, these solutions are rated as non-flammable. Users should always review product inserts or the material date safety sheet (MSDS) for the specific product used. With today’s technology this information is readily found online. To provide proper disinfection and for proper infection control, many facilities use disposable wipes containing alcohol and a germicidal such as benzalkonium chloride. Considering the product packaging recommends use only between cases, these wipes should not contribute to surgical fires related to ignition sources used during a procedure. It is of note that these wipes are considerably oculo-toxic and contact with the eyes can result in temporary or permanent eye damage. The National Fire Protection Agency (NFPA) Codes offer guidance to governmental agencies such as the Centers for Medicare and Medicaid Services (CMS) and also to accrediting agencies such as The Joint Commission and others. The NFPA Code determines the safe amount of alcohol that can be stored within a smoke compartment, setting a limit of 10 gallons of alcohol-containing solutions, which includes ABHRs, that can be in use in a single smoke compartment (outside of an approved storage cabinet), plus an additional 5 gallons per smoke compartment that can be stored. As with any standard, the NFPA codes and CMS requirements are revised frequently; users should refer to the most current NFPA and CMS references as a source of information. Selection of an appropriate prep solution based upon antimicrobial and germicidal properties is beyond the scope of this article, but other factors in addition to infection control issues should be considered for the safe care for our patients. For alcohol-based prep solutions, the selection of properly sized pre-filled applicators is a key step in fire prevention. Applicators too large for a given prep area or anatomical segment may result in an increased fire hazard due to the amount of excess prep requiring disposal and removal, or if all of the prep is used, the excess can accumulate in pools on or around the patient. Every effort should be made to match proper applicator size to the area needing coverage. Most commercially available surgical preps that are alcohol based have a recommended drying time of at least 3 minutes. The “fine print” in most package inserts warns users that when applied to hairy areas or in body folds or creases a greater drying time of up to 1 hour may be required. Providers need to be aware of specific instructions for the product used. If at all possible, alcohol-containing solutions should be kept out of the patient’s hair. Adequate drying times should take place prior to the application of drapes or surgical barriers. Drying times are specifically addressed in some institutional surgical safety checklists to encourage communication between surgical team members. According to NFPA Code, any excess or remaining flammable prep solution, along with any other solution-soaked materials, must be removed from the operating room prior to the use of any ignition source. Although the NFPA and CMS regulations define the minimal best practice, the authority having jurisdiction (AHJ) for your facility takes precedent. Practitioners and facilities should refer to their AHJ for specific regulations and fire codes. CMS usually adopts NFPA codes as their regulatory standard. Following NFPA revisions, CMS usually adopts these within 8-12 months. Joint Commission standards usually conform to NFPA and CMS revisions. Dr. Cowles is Assistant Professor, Department of Anesthesiology, and Perioperative Medicine and Clinical Medical Director, Department of Anesthesiology and Perioperative Medicine, Division of Anesthesiology and Critical Care, and serves as the Perioperative Safety Officer, at the University of Texas MD Anderson Cancer Center, Houston, TX. Jen LI Chang, CRNA, MS is a nurse anesthestist at the MD Anderson Cancer Center in Houston, TX.